NASHVILLE, Tenn. - Sept. 20, 2013 - PRLog -- Hollywood -- New York -- The bluegrass giants from Nashville, The Smokey River Boys, have released their 14th album to the public. The new project features their #1 single release from earlier in the year entitled “ALL PURE COUNTRY.” The group represents over 40 years of recording for some of the top labels in the world. The boys started on Time Life-Warner and were all originally in the movies of the old west. They played behind such movie superstars as John Wayne, Gene Autry, and Randolph Scott. The second generation of bluegrass giants are featured on MCA Universal’s Best Of Banjo, Dueling Banjos and the 20 Greatest Hits Of Bluegrass. http://www.cdbaby.com/artist/smokeyriverboys Today’s superstars are on the Platinum Plus Gold label and they have recorded 3 albums for that label. The O BROTHER album was their top selling album until 2012, when they released their Greatest Hits package. This current album ALL PURE COUNTRY, for 2013-2014 reflects the new sound of their lead singer Randy Hardcastle. Some critics have said that the Smokey River Boys sound too much like the Oak Ridge Boys or the Statler Brothers. “We’ll take that kind of criticism all day long,” their manager Robert Metzgar told Entertainment Headline News Hollywood Their #1 All Pure Country single that hit radio earlier this year, went to #1 in the Hot Country Singles chart of the New Music Weekly magazine and the group was nominated “Group Of The Year” by that magazine and “Group Of The Decade” by the Academy Of International Recording Artists. The group is already in the Legends Hall Of Fame in Branson, Missouri. 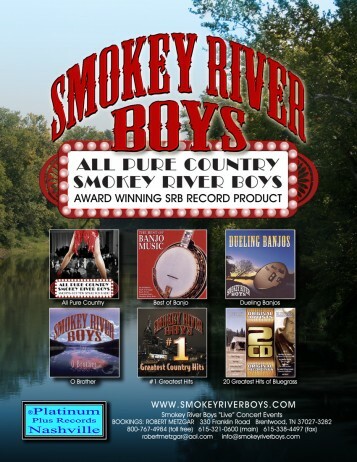 http://www.smokeyriverboys.com Featured on the powerful distribution arm of CDX Nashville, the Smokey River Boys have earned their place in music history. Three generations of singers and a 40 year history in bluegrass music has positioned them as one of the most sought after groups in music today. The group hails originally from Fairfield, Texas and has a long history of success in the state of Texas. The group was elected to the West Texas Hall Of Fame in 2003 and participated in a special project to assist Autistic children in 2008. In cooperation with the world’s greatest honky tonk in Fort Worth, Texas, BILLY BOB’S, the Smokey River Boys donated their “live” appearance and performance of “Man Of Constant Sorrow” to the National Autism Society. http://www.platinumplusgold.com You can purchase the great product of the Smokey River Boys at any retail music store or on iTunes, Amazon or at Wal-Mart Stores. If you stop by the Cracker Barrel ask for the latest All Pure Country album from the most awarded bluegrass group in all the world, the Smokey River Boys. Further information is available at Robert Metzgar, GM SMOKEY RIVER BOYS MANAGEMENT 330 Franklin Road Brentwood, TN 37027-3282 800-767-4984 (toll free) 615-321-0600 (main) 615-338-4497 (fax) www.capitolmanagement.com info@capitolmanagement.com *If you want to contact Mr. Metzgar directly, send an email directly to robertmetzgar@aol.com and he will respond to your requests within 48 hours.